Scientists at a behavioral studies facility in Budapest set quite a tasks for themselves. They set out to analyze, with non-invasive methods, dog brains to see if our canine companions could detect emotions in both human and dog voices and to compare it to human brain activity when given the same stimuli. The hardest part, in my opinion, must have been training 11 dogs to lie perfectly still for about 10 minutes while they were being scanned by an MRI machine. The neurobiologists chose Border Collies, Labrador Retrievers and Golden Retrievers for the study. (I myself would have chosen Basset Hounds or English Bulldogs, which would have been a leg up – or perhaps down – in the activity department.) One little movement and the scan would have to start over. 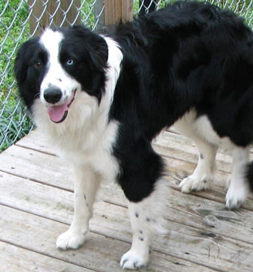 Border Collies like Shadow, an adoptable dog in Arkansas, were subjects in the study. Using standard training techniques — lots of rewards — the scientists accomplished step one after about 20 sessions. Then it was time to get down to the business of the research. Each dog listened to about 200 sounds, some human noises, like laughing and crying, some dog sounds, like whining and barking, and some environmental ones, for instance, a phone ringing. The scientists analyzed the data reflected in the scans and compared it to similar scans in humans. They found a special little patch of real estate in the dogs’ brains that responded when the dogs heard emotional tones like happiness and sadness. Although their brains responded most strongly to their own species, they also reacted to changes in human emotional vocalizations. The response areas in the dogs’ brains was located in the same areas as they are in humans, which is of evolutionary interest to the scientists. The study confirmed what most of us have known all along — that our furry friends know when we need a little extra snuggle. Read more about this study in Michaeleen Doucleff’s NPR health blog.